Galicia, Ría de Arousa, 2011. 09 Dec 2011. Ignacio Bárbara. © Ignacio Bárbara (barbara@udc.es). 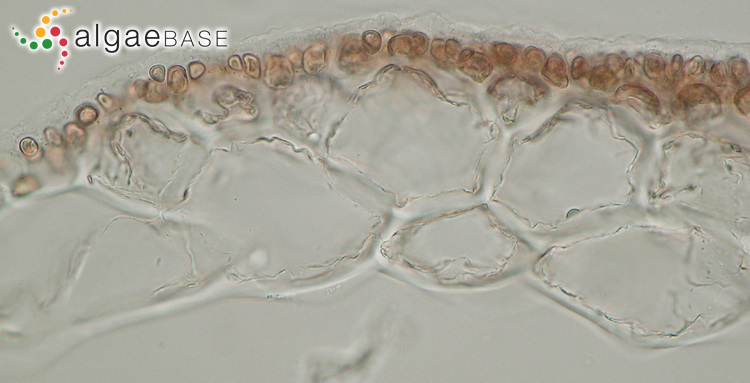 Galicia, Ría de Arousa, 2011, microscope. 09 Dec 2011. Ignacio Bárbara. © Ignacio Bárbara (barbara@udc.es). 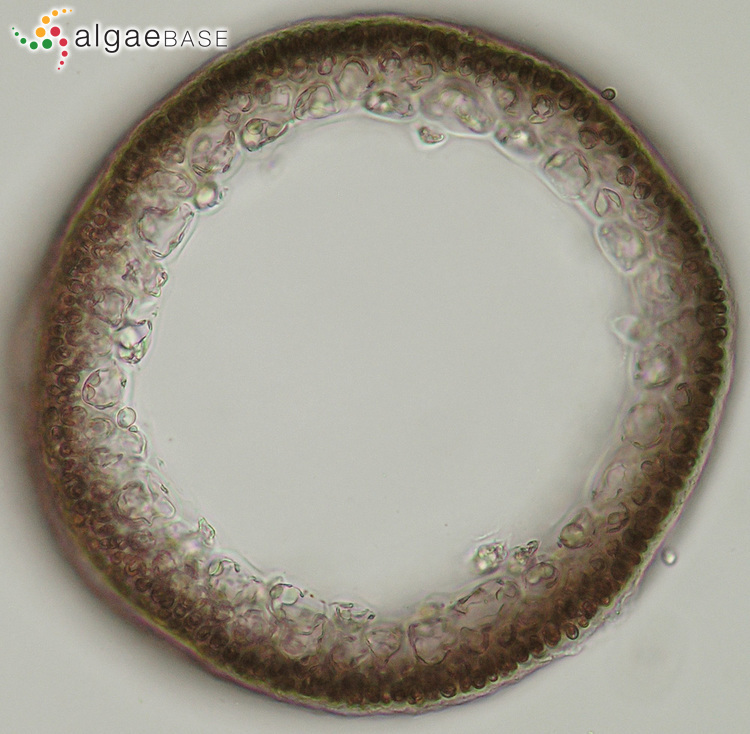 Ría de Arousa, Galicia, Spain, 2005, Ignacio Bárbara; TS showing hollow thallus and gland cells. Ignacio Bárbara. © Ignacio Bárbara (barbara@udc.es). 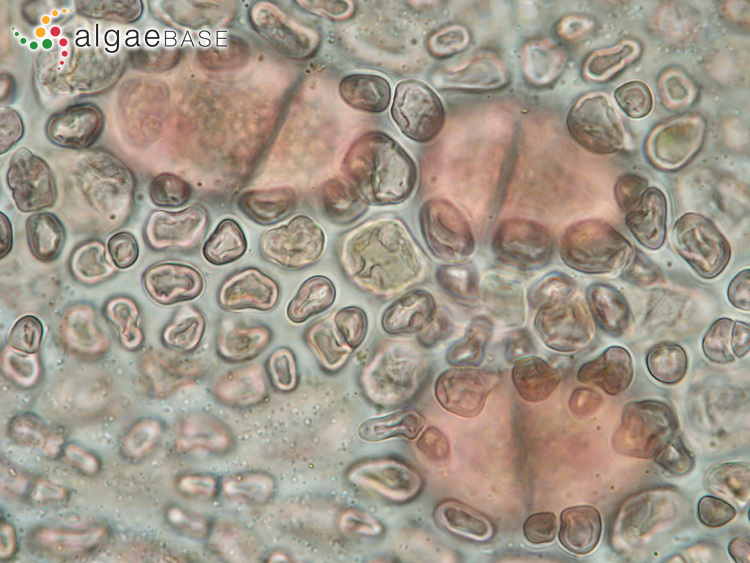 Ría de Arousa, Galicia, Spain, 2005, Ignacio Bárbara; surface view showing cortical cells and embedded tetrasporangia. Ignacio Bárbara. © Ignacio Bárbara (barbara@udc.es). 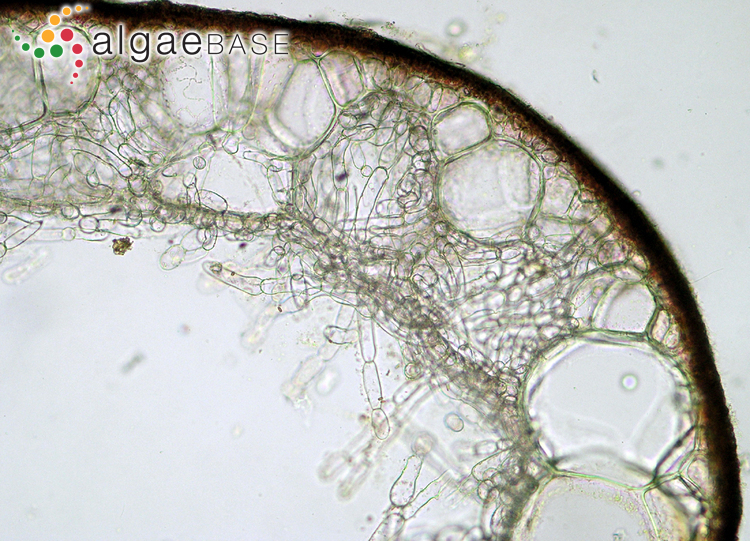 Ría de Arousa, Galicia, Spain, 2005, Ignacio Bárbara; TS showing hollow thallus and thin cortex. Ignacio Bárbara. © Ignacio Bárbara (barbara@udc.es). 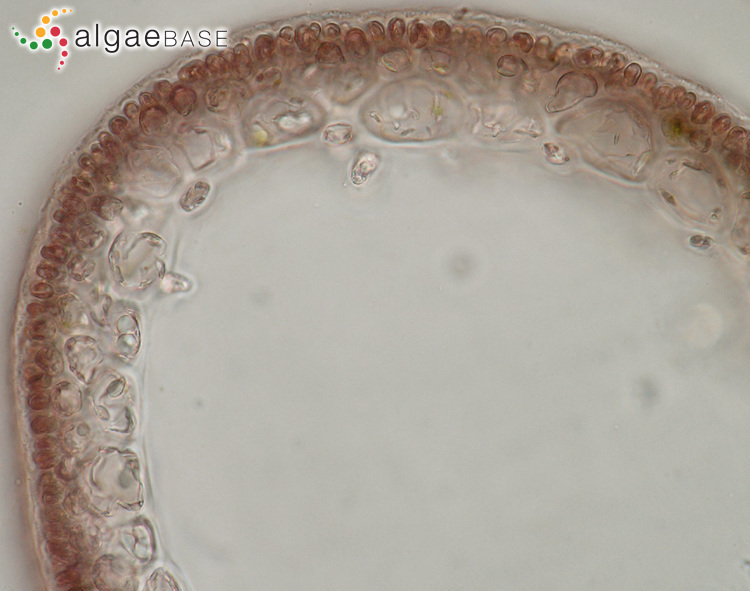 Ría de Arousa, Galicia, Spain, 2005, Ignacio Bárbara; TS showing hollow thallus and gland cell. Ignacio Bárbara. © Ignacio Bárbara (barbara@udc.es). Ría de Arousa, Galicia, Spain, 2005. Ignacio Bárbara. © Ignacio Bárbara (barbara@udc.es). Ría de Arousa, Galicia, Spain, 2007. Ignacio Bárbara. © Ignacio Bárbara (barbara@udc.es). Published in: Yamada, Y. (1932). 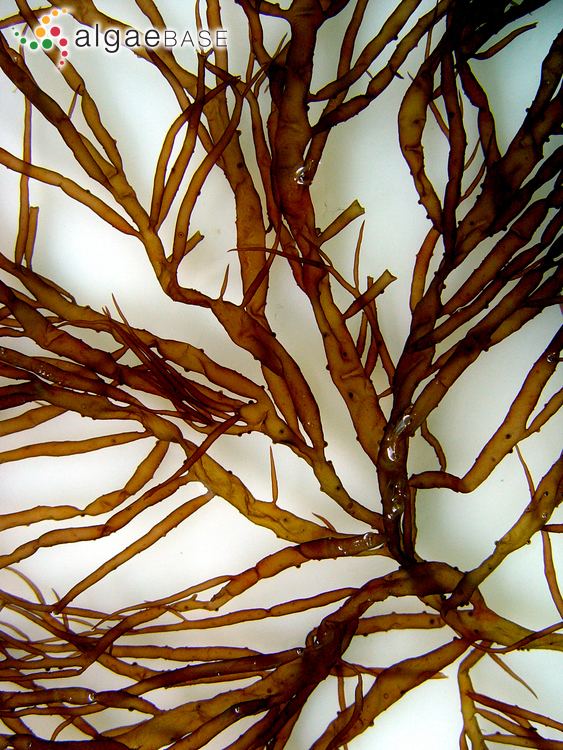 Notes on some Japanese algae, III. Journal of the Faculty of Science, Hokkaido Imperial University 1: 109-123, 5 figs, pls XXI-XXV. 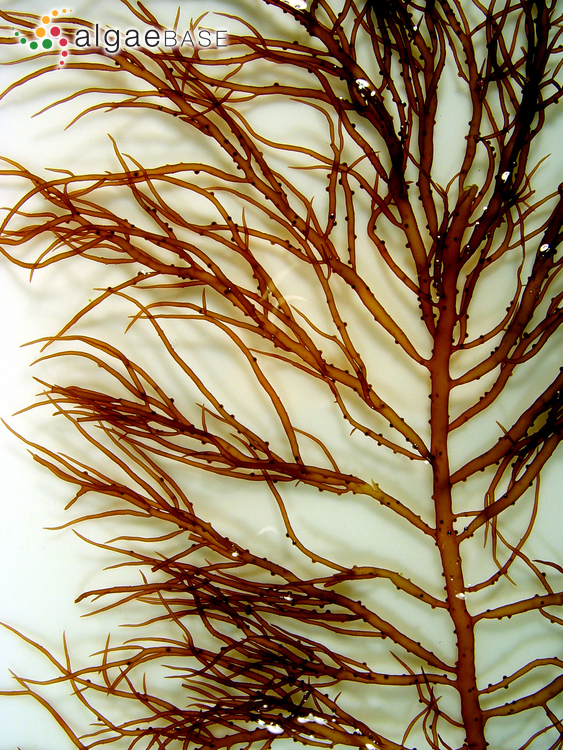 Type locality: "Hakodadi, Japan." [Hakodate, Hokkaido] (Harvey 1860: 332). Lectotype: C. Wright; 'on rocks at low tide'. TCD (Masuda et al. 1995: 196, fig. 19). Bárbara, I., Lee, S.-Y., Peña, V., Díaz, P., Cremades, Oak, J.H. & Choi, H.-G. (2008). 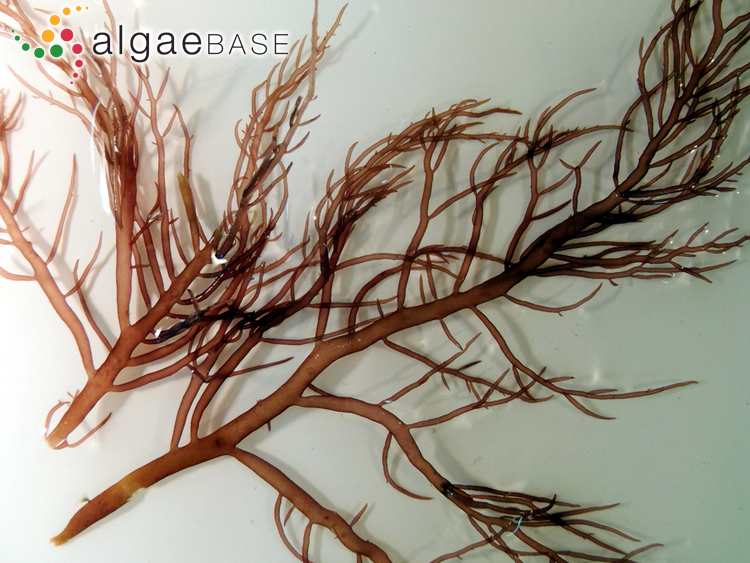 Chrysymenia wrightii (Rhodymeniales, Rhodophyta) - a new non-native species for the European Atlantic coast. Aquatic Invasions 3: 367-375. Bunker, F. (2014). Chrysymenia wrightii (Wrights golden membrane weed) a new non-native to southwest England. Phycologist 87: 20 only. Accesses: This record has been accessed by users 5656 times since it was created. Ben Maïz, N., Boudouresque, C.-F., Riouall, R. & Lauret, M. (1987). The algal flora of the Etang du Thau (Mediterranean coast of France): on the occurrence of a Japanese member of the Rhodymeniales, Chrysymenia wrightii (Rhodophyta). Botanica Marina 30: 357-364. Schmidt, W.E., Lozada-Troche, C., Ballantine, D.L., Arakaki, N., Gabriel, D., Norris, J.N. & Fredericq, S. (2017). 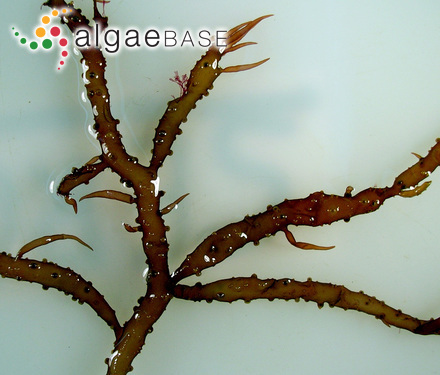 Taxonomic transfer of the red algae Chrysymenia enteromorpha and C. wrightii to the genus Botryocladia (Rhodymeniaceae, Rhodymeniales). Phytotaxa 324(2): 122-138, 30 figs, 2 tables.